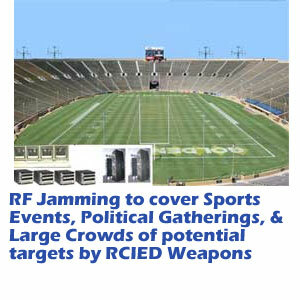 The Stadium Jammer SJ-5000 is a Bomb Jammer ™ that has been customized to broadcast jamming signals by or at an area where many people gather. This customized bomb jamming system or Stadium Jammer works to defeat remote controlled terrorist bombs from detonating at a stadium, sports complex, and large gathering areas that could be targeted by a terrorist attack. The SJ-5000 uses stationary jammers built into tower mounted jamming modules to provide protection for stadiums and crowded areas around a stadium from radio controlled improvised explosive devices (RCIEDs). The benefit of this type of system is to protect those in the area from weapons detonated by remote control. The Stadium Jammer does have an effect on communications which is why communication windows are now part of the configuration when a customized solution is required, as most users of the Stadium Jammer do not wish total radio jamming to go into effect.